The shoe of cards can consist of any number of decks from 1 to 8, this depends of the rules of the house. The number of decks used at a table affects the odds of house. The more decks the better the odds are for the house. The casino lobby indicates the number of decks used in each game. After the cards are dealt the player must play his/her hand first. The player can make several choices once his two initial cards are dealt. The player's action would depend on the strategy used by the player to the two initial cards. Some tables will have rules that other tables may not have so it is a good idea for the player to find out which tables in the casino are the ones that suit his or her gambling style. These options are indicated in the casino lobby when choosing a game. 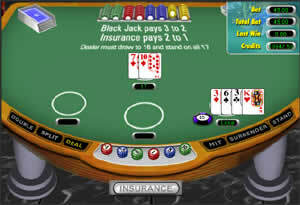 The Players hand is over when: A Blackjack comes up, Player chooses to stand or Player busts .